Women make important contributions to the attainment of peace, but they remain grossly underrepresented in official peacemaking processes. This study and policy brief demonstrate how women from civil society in the Philippines, Northern Ireland, Guatemala, and Kenya accessed and shaped peace processes in their countries. It illustrates that women from civil society have greatest impact on peace agreements— making them more comprehensive and durable—if they are involved in official roles during the peace process. 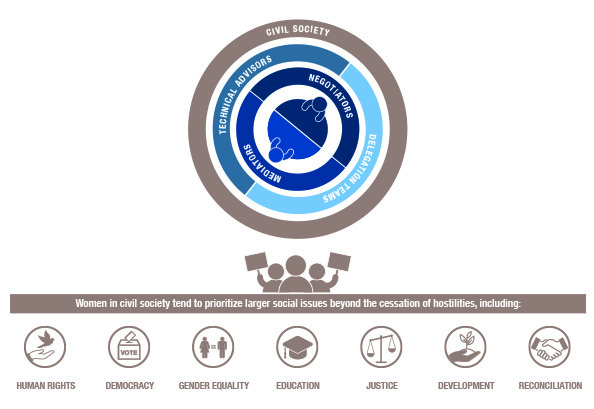 • Including women from civil society in official roles—such as negotiators, technical advisors, or on delegation teams—is critical to the creation of a sustainable peace. • In official roles, women help move parties closer to a peace agreement. When women from civil society are at the peace table, they serve as “honest brokers” who speak to all parties involved (N. Ireland) and their “meticulousness” in drafting language brings opposing sides to consensus, leaving little room for ambiguity that could later contribute to the dissolution of a fragile agreement (Philippines). • Although less effective, women from civil society can also influence a peace agreement when they are not at the peace table, but instead have formal direct avenues to access the negotiations. These mechanisms, such as official consultative bodies, enable women to impart an agenda into the peace negotiations through a systematized process (Guatemala). • Ad hoc mechanisms are an even less effective way for women from civil society to “pressure” those at the peace table on key issues from the outside (Kenya). • Women from civil society help craft more comprehensive agreements, as their goals support both ending war and building peace. • Building capacity for women in civil society is an important investment for sustainable peace. Within the context of negotiations, women facilitate consensus-building discussions and champion issues that help rebuild society. When peace processes begin, women must be ready to effectively formulate forward-thinking policy proposals and strategically navigate an arena that has historically locked them out.